Hi, I'm Alexandrina. I live in Moscow (Russia). This is my new Christmas ornaments for january. It is not "Joy", it's "Wish" by Shepherd's Bush. I like it so much due to the funny buttons on this design. Greetings from snowy Moscow! 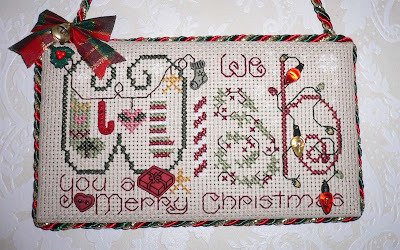 Oh this is darling - looks like it was such fun to stitch! SB designs re wonderful. Congrads on your finish. I really love this design and you did a superb job of stitching and finishing it. I bet it was a joy to stitch.